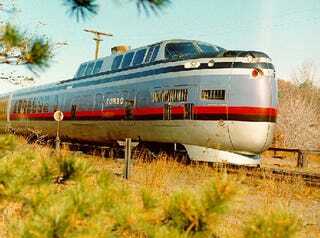 While the united state of the passenger train may be fairly well derailed today, it wasn't always the case. With a rolling target of 1968, Igor Sikorsky and company applied the engineering genius of their helicopters to the Turbo Train. The train featured a gas turbine powerplant along with an aircraft-like body that leaned the into the corners to achieve greater velocity on existing rail beds. A mere ten years later Hollywood attempted but failed to glom onto the momentum of the both the Love Boat and the Turbo Train with a gem of a production called Supertrain.